Fueling: Four 1,000-gallon and two 2,000-gallon on-site refueling stations located across the county. To cut rising fuel costs while finding new technology that allows for continued use of the county fleet’s alternative fuel choice — propane autogas. 50 percent fuel cost savings. Up to $173,000 fuel savings within a one-year period. 320,000 pounds of carbon dioxide per year eliminated from the county’s total carbon footprint for entire propane autogas fleet. Georgia’s DeKalb County, a hub of activity boasting a population of 700,000 near Atlanta, is the third most populated county in the state. 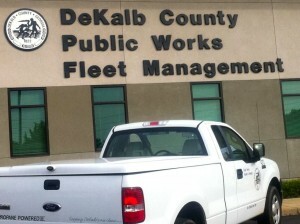 As the home to thousands of acres of wetlands, forests and streams, DeKalb County officials have been committed to reducing the carbon footprint of their fleet vehicles. The Atlanta Regional Commission has recognized DeKalb County with a “Green Communities” designation for their efforts in conserving energy, water, and fuel, reducing waste, and protecting and restoring natural resources. Due to their successful track record using propane, DeKalb County purchased 75 ROUSH CleanTech Ford F-Series pick-up trucks each equipped with a dedicated liquid propane autogas system. These trucks have been in service since 2008. DeKalb County’s ROUSH CleanTech trucks feature an in-bed tank system, chosen by the county to deliver maximum vehicle range. The vehicles are used for code enforcement, revenue collection, and as courtesy vehicles for department supervisors and superintendents. Regardless of the job, Miller says these propane autogas trucks experience similar miles per gallon as their gasoline and diesel counterparts and excellent drivability, all while reducing the county’s dependence on foreign energy and saving taxpayer dollars with lower fuel and maintenance costs. The county’s drivers have expressed appreciation for the trucks’ horsepower and acceleration. DeKalb County’s usage of safe and non-toxic propane autogas to power their on-road fleet has reduced their carbon footprint by about 320,000 pounds of carbon each year, and eliminated more than 100,000 gallons of imported oil from the supply chain. Since 2009, the county saved $563,000 in fuel costs with their fleet of vehicles fueled by propane autogas (which includes some off-road equipment). “Gasoline costs us about $3 per gallon, while our propane autogas costs $1.50,” said Miller, his figures based on the county’s bulk fuel rates. Historically, propane autogas costs have been 30 to 40 percent less than gasoline and almost 50 percent compared to diesel. According to the Propane Education & Research Council, these cost savings are expected to continue for the next 25 years. Additionally, the federal government and many states offer various programs and tax incentives to encourage the use of alternative fuels. County officials worked with their local Clean Cities Coalition to secure grant funding during the installation process. The sites were chosen to coincide with existing county fuel sites and to offer easy access for county employees. Miller found that the ease of use and rate of fill of these stations is comparable to gasoline and diesel fuel pumps, making the transition from pumping one fuel to the next easy on their drivers. Drivers can also access any one of the thousands of public propane autogas stations across the U.S.
DeKalb County purchased their propane autogas fleet vehicles from Allan Vigil Ford, a local Ford dealership. Located in Morrow, Ga., Allan Vigil’s service team also handles all maintenance of the county’s ROUSH CleanTech vehicles. According to Tom Markham, field service engineer for ROUSH CleanTech, once a fleet manager commits to purchasing, ROUSH CleanTech’s team steps in to establish communication with the local Ford dealership of preference, evaluate the service department of the dealership of choice, and begin to train service technicians. ROUSH CleanTech propane autogas vehicles maintain identical factory Ford warranty, performance and serviceability as gasoline counterparts. According to Miller, the county will continue to integrate propane autogas vehicles into their fleet. About ROUSH CleanTech: ROUSH CleanTech, an industry leader of alternative fuel vehicle technology, is a division of ROUSH Enterprises based in Livonia, Mich. ROUSH CleanTech designs, engineers, manufactures and installs propane autogas fuel system technology for light- and medium-duty Ford commercial vehicles, and Type A and Type C Blue Bird school buses. As a Ford QVM-certified alternative fuel vehicle manufacturer, ROUSH CleanTech delivers economical, clean and domestically produced fueling options for fleets across the country. Learn more at ROUSHcleantech.com or by calling 800.59.ROUSH.